Here’s an training tip from Alison that will improve your balance, core strength, and leg strength all in one exercise. 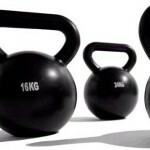 Take two kettlebells of different weights — say, five pounds and ten pounds — one in each hand. Then do ten squats. Then switch hands and do another ten. Then do ten bends (touch your toes with the kettlebells and then stand up). Then switch hands and do another ten. Do three sets of each. The general idea is that one side is working harder than the other. To compensate, your core muscles have to kick in to keep everything in balance. You build strength in your legs but also improve your balance and core — especially your obliques. I did a bunch of these and I’m a much more balanced person now.